Zero-to-100-to-Zero in 13 Seconds. Gets those male juices flowing, don’t it? That was what the British-bodied, big-block Ford powered Shelby could do back in 1967. There aren’t many things on four wheels that can match that today, but this was ’67 there wasn’t a thing that could touch the Shelby Ford AC Cobra. Racer Carroll Shelby’s inspiration for the Cobra came from the most basic hot rod trick in the book. Take the lightest, most slippery body you can find and stuff its cradle with the biggest plant it can handle without choking to death or flying apart. Mr. Carroll liked the looks and lines of the English AC Ace, a nimble aluminum-bodied tourer that tipped the scales well below 2000 pounds in stock trim. Still, Shelby couldn’t help but wonder what the little rascal might accomplish with eight cylinders of American testosterone lurking under the bonnet. This is the idea Shelby pitched to Ford’s Lee Iaccoca back in the early 60s. Iaccoca, ever a man receptive to strange and terrible ideas, told Shelby to do go ahead and make his day. Ford acquired an AC Ace and sent Shelby to work. 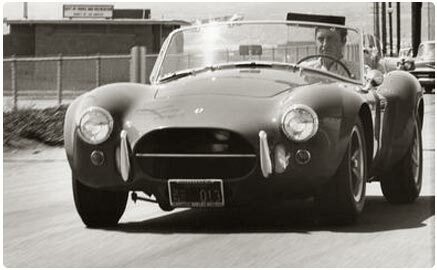 Shelby took the aluminum-bodied Cobra, stiffened the suspension, and fitted a 289 Ford. It wore disc brakes on all four corners—very rare for the time, with an A-Arm front suspension and hot-rod style coil-over rear. The ’63 AC Cobra was plenty fast. It ran 0-60 in 5.6 seconds and pulled a high 13s quarter. It was still plenty nimble. The AC Ace, on which it was based, was designed for twisty European roads. And this was just the beginning. By 1967, the Cobra’s final production year, Ford offered two available engines, the 427 Cubic Inch FE, and the 428 Cobra Police Interceptor. Even with the big block, the Cobra still only weighed 2089 pounds, and it hauled like none before and few since. The Shelby Cobra was, to the best of my knowledge, the first stock street car to hit 60 from a stand still in less than four seconds. Properly tuned, it could turn the quarter in the high 11s. It could pull close to one G on the skid pad and top speed ranged out around 165 mph. The special drag racing Cobra converted in the US – aptly named Dragon Snake – was capable of an 11.81 quarter mile! Remember, this was on 15”, ’67 era Goodyears. Think what a stock 427 Cobra could do today on a set of 17s wrapped in ZR rated Nittos. Maybe tack on an Eaton Supercharger, some Baer brakes, and nitrous. No, best not to think about it! Sadly, The Shelby Cobra died quick death after 1967. Most of drivers who really lusted after it — kids, mostly, couldn’t afford it. That left rock stars, who tended to drive their Cobras into walls and off of cliffs, as rock stars were wont to do. Waste of a good car, if you ask me. Shelby’s still around of course, a hired gun, lending his talents and his name from time to time to the Big Three. His most recent project was last year’s Shelby Dodge Durango, a spliffed-up, souped-up Mopar Sub with a supercharged 360 splashed in Cobra blue with white racing stripes. It’s just not quite the same. And we won’t even discuss the 1984 Shelby Charger, the automotive equivalent of the drunken one-night-stand where you wake up the next day, roll over to see whose there, and run for the door without even bothering to grab your socks. These days a mint ’67 edition Cobra will run you somewhere between $100,000 and a quarter million. There are plenty of companies stamping out replica versions of the Cobra, with fiberglass bodies and modern suspensions. Classics by Elite, for example, offers a turn-key Cobra for $32,500 that’s powered by a 5.0 Ford rated at a fairly weak-kneed 210 horsepower…and this is still a low 14-second car. A number of state-of-the-art replica kits are available in South Africa, as well as pre-assembled cars at around R145,000.00. The Cobra replica’s from around the world have one thing in common – they are a celebration of one of the greatest sports cars ever built!